Amber Jefferies: Valentine's Day Obsessions! If you're anything like me, you just realized how quickly Valentine's Day snuck up on you this year and you still have some shopping to do for your sweetie. This is one of my favorite times of the year. It's hard to hate all of the pink and red. I don't hate the heart-shaped chocolates either. 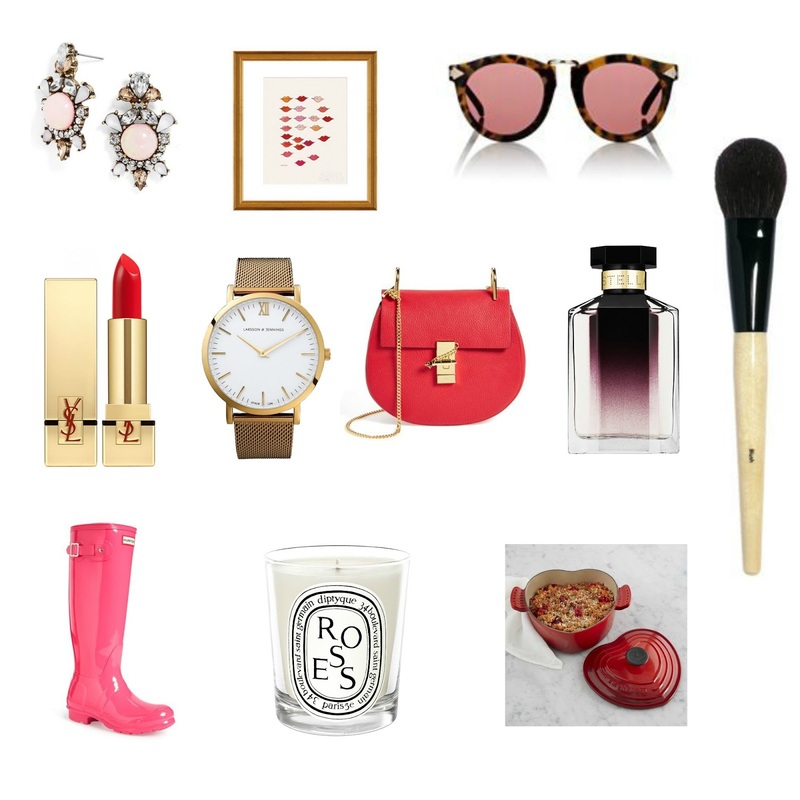 :) Here are some Valentine's Day picks that have me feeling like the emoji with the heart eyes. Earrings | I pretty much love anything from Baublebar, and these earrings are no exception. I also just ordered these in two different colors. Art | We moved into our house a little over a year ago and I am just now getting around to hanging things on the walls. Oops... This would be so cute to hang around Valentine's Day. Sunnies | It has definitely been sunglasses weather around here lately. Loving these pretty days! Lipstick | This YSL 13 color is perfection! Also love love love the YSL Rouge Volupté Shine Color 29. Watch | I like how dressy this watch can be compared to others I own. Crossbody | A red crossbody has been on my wish list ALL year. How adorable is this one?? Perfume | I got this perfume for Christmas and it is GOOD. Makeup Brush | Bobbi Brown makeup brushes are worth every penny. Rain Boots | Splashing in puddles with pink rain boots... Heaven. Candle | These candles just smell sooo good. This is also a must have. Dutch Oven | My Le Creuset Dutch Oven was one of my favorite wedding gifts. When I saw the heart shaped Dutch oven I almost died. Freakin. Cute. © Amber Jefferies: Valentine's Day Obsessions!